Sharing the limelight may mean working behind the scenes – in effect, not getting any “light” at all. Team players… handle a myriad of other things required for accomplishment of a team’s task. I’ve enjoyed every one of our conversations so far, but the one you’re about to read is uniquely significant. Why? 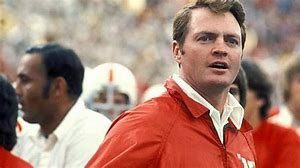 Well, I’m of the opinion that Tom Osborne is one of the more humble fellows you’ll ever run across, which means that he’s quite hesitant to talk about himself. Sure, he’ll talk about his approach to life or his line of reasoning as to why he made choices in his career and such, but to really know the man, the leader, the visionary? It might be of benefit to ask someone who knows him in a more familiar way, someone who’s spent many a day and year working for and with and alongside him. Which brings us to his longtime secretary, Mary Lyn Wininger. 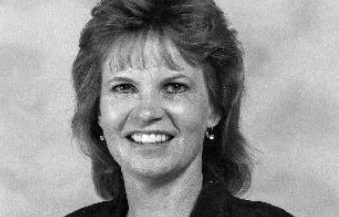 Self-effacing and quite humble in her own right, Mary Lyn was a force in the coaches’ offices, especially when it came to maneuvering and maintaining some sanity among the busied offensive staff of the day. Tag-teaming with Joni Duff (who handled the duties for the defensive staff), their assistance, wisdom, surefire stability and ever-present availability made the whole place hum. Question: Thanks for making time for me, Mary Lyn. Mary Lyn Wininger: You’ve gotten me fired up, Paul. I hear you’re talking to all of these players and it brings back so many good memories. I hear you’re trying to get a hold of the Peter brothers and the Makovickas, too. Q: It seems the concepts of “unity & caring” were very motivational for the football the program. Did you sense that, too? MLW: Oh, definitely. And it started from Tom. He loved those players. Those were his kids and he would do anything for them. And in turn, those players would do anything for Tom. Definitely. That was there and was very evident in all the battles he had to go through, whether it be trying to fight NCAA rules to Ernie Chambers. (laughs) The battles we had to fight… Ernie’s heart was in the right place and he wanted to pay the athletes, but we couldn’t: “It’s an NCAA violation to do this. And it’s the law, so that wouldn’t work.” Just funny little things like that. But Tom, not only for the players but for the staff, he had such a strong faith. I guess that’s what impressed me, as well, trying to be the father figure and still living his faith and living by example. People truly loved him. I learned so much from him and the program. Q: So let me ask you, Mary Lyn, are you an original Nebraska girl? 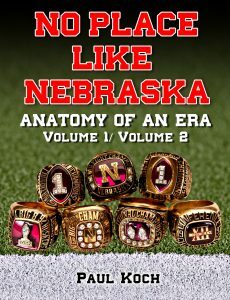 MLW: Yep, I’m a Nebraska girl and I grew up in Auburn, Nebraska, which is where the Kelsay boys were from. And I hate to tell this story, but I went to school at Johnson-Brock and my basketball coach was Jackie Kelsay, the mother of Chad and Chris. My senior year she was pregnant -and you know, I didn’t quite keep track of that kind of thing- and she comes in to the football office one day and she brings Chad in… and here she was pregnant with Chad when I was in high school! And, oh my gosh, it made me feel really old. (laughs) Chad and I were really close and we really bonded, especially with the ties to Auburn. But I went to school at the university and had actually worked at the College of Agriculture. Q: Over on East Campus? MLW: Yes, I actually got an Associates Degree and felt like two years of school was enough, and went out to East Campus to work for the School of Agriculture. I had this not-too-exciting job. But anyway, one of my friends called and said, “Hey, there’s an opening in the football office and it’s Assistant to the Head Football Coach,” but nobody she knew could apply because you had to know shorthand (which is no longer used anymore). But that’s how I got the job: because I knew shorthand. So on the last day that it was open they kind of dared me, because I’m like, ‘I’m not looking for another job. What would my boss say?’ and all this stuff. And they were, “You’ve got to at least try.” So I put my name in and they called me the next day, to call me in for an interview. So I did, and just like that they offered me the job! And then I had to go tell my boss, of course. And if it would have been anybody else they would have been mad, but they were like, “Oh, since you’re gonna go work for Tom, all right.” So they understood, so that was kind of cool. It was spread across campus; the whole university just had so much respect for him. Q: What were you doing on East Campus? MLW: I was working for the Dean of the College of Agriculture. It was entry level and I did a lot of computer input and worked with students and stuff like that. It was okay, but I was stuck in the back room doing computer input, which wasn’t real exciting. But then I was presented with this great opportunity, so it was better than what I was doing. MLW: (laughs) Exactly! Yeah, that’s what it was. Q: Sounds like my first job at the Devaney Sports Center weightroom. MLW: That’s how you started? Q: Yep, working under Bryan Bailey over there. MLW: Do you still talk to him now? Q: Oh yes, about every few weeks we talk. And by the way, he said to tell you ‘hello.’ He’s still the workaholic that he always was. Q: So the job interview, were there any coaches in there for the interview? MLW: It was just Tom. And I didn’t even really have time to think about it, because it was such a whirlwind: “Can you come in?” I think they actually called that morning and I went in that afternoon for the interview. I’ll always remember: I didn’t have time to worry about what to wear because I didn’t have time to change. I’ll always remember going in there. 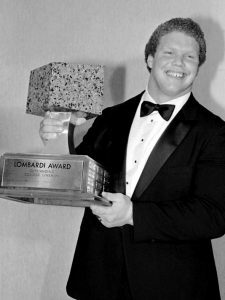 And when I walked out after they’d given me the job, Dave Rimington was sitting there at the time and he teased, “It’s just your red hair that did it.” (laughs) I’d like to think it was more than the red hair, but that was always his comment. Q: Dave was a redhead, too, right? MLW: He was, and then Tom, too. It was like there was this red-headed thing going on. But he was the only one in the interview, coaching-wise. I interviewed with some of the staff people that were there. Q: So what year was this? MLW: It was in ’83 before the season started. My first season working there was Turner Gill and Irving Fryar and their senior year, so we went all season without losing and then in the bowl game, you know, we went for two and didn’t make it. Yeah, that was my first year. Q: So did you have a chance to get broken in before the games started? MLW: I actually started in January. I got started before spring ball and all that, it must have been in January of that year. 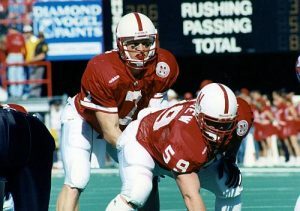 Dave Rimington was still around at that time. Q: Do you recall your first day working there? Any peculiar happenings or impressions of how things operated? MLW: The first days I worked there it was kind of odd, because it was recruiting season, so the coaches were gone a lot. It was really, at first, very intimidating, because you think about it: a little gal coming from Auburn, Nebraska and working for Coach Osborne. And he dictated a bunch of letters, and I’m sitting there taking shorthand. And I don’t know if you’ve done shorthand before, but you really have to concentrate on what you’re writing, and my mind was like, ‘Oh, my gosh! I’m in here with Coach Osborne’-type of thing. (laughs) So it was really hard to concentrate on what I was supposed to be writing because I was so in awe. And he’d be there for a day and then recruit all week, and then he’d come in on Friday and we’d have recruiting visits that weekend and stuff. So I just remember it was so frantic until I really got to know him. And he’s human like all of us, a super guy. But it was just the whole thought of, ‘Oh, my gosh, this is really my job! I’m supposed to answer his phone and type his correspondence.’ It was intimidating. Q: Did you call him ‘Tom’? Q: Did it take a while to get accustomed to that? MLW: Well, actually it didn’t. And this is probably bad -because everybody teaches their kids “Mr. this and Mrs. that”- but down in small-town Nebraska you called everybody by their first name. Mom and Dad were farmers and we didn’t do much of the high society things, calling people Mister and such, and when he said, ”Call me Tom,” I was like, ‘Okay,’ because he gave me permission to do it. MLW: He wasn’t into titles. I always remember when I was typing this one book. I typed ‘On Solid Ground’ for him, and it was the second book he wrote. The first book I was involved with, but not as much as the second book. The second book he’d give me these little audiotapes and I’d type them up and work on editing them and such. Then I’d send them to Gordon Thiesen (who also was a former player) and then he would edit it as well, and we kind of worked together on it. And I’ll always remember Gordon coming in at the end -and in the foreword part Tom said, “I want to thank my Secretary, Mary Lyn Wininger.“ And Gordon said, “Are you sure you want to put the word ‘Secretary’ there?” And the look on Tom’s face was like, ”Well, what else would I call her?” Titles are nothing to him, no ‘Administrative Assistant’ or that kind of thing, he didn’t get wrapped up in that part of it. Q: Some puffed up name, like the term ‘custodial engineer’ referring to a janitor?